WINTHROP -- Jim Remley lost a flagpole, but he gained one dandy of a story about one determined bear that has been making the rounds at bird feeders and garbage cans across central Maine for the past several weeks. WINTHROP — Jim Remley lost a flagpole, but he gained one dandy of a story about one determined bear that has been making the rounds at bird feeders and garbage cans across central Maine for the past several weeks. The specifics of Remley’s run-in with a bear last week may be unusual, but across the state bears sightings in general are proving unusually common this year. At least one of those wayward bears has made its way to the Augusta area and has been spotted dozens of times since. The bear that Remley encountered Monday night highlighted to what lengths bears will go to get that food. Remley and his wife were settling in to sleep about 11 p.m. on May 18. Outside their window, Remley’s 30-foot flagpole was festooned with bird delicacies, including suet, a net thistle bag and a feeder. The lowest-hanging food was about 12 feet off the ground. “I’m hearing this clang, clang, with the clips banging against the metal pole,” he said. The couple first suspected a raccoon trying to reach the bird food, but the noise didn’t let up. Meanwhile, their Yorkshire terrier dog was more than a little disturbed. “I said, ‘I have to find out what that is,” Remley said. He stepped out onto the back deck and could not believe his eyes. And, it turned out, the bear had bent the flagpole to a near 45-degree angle to reach the food. Remley, hoping to scare it off, got a flashlight. The bear’s yellow-eyes shot back. Finding food pretty much dominates a bear’s time during the summer months, and Winthrop has turned into something of a supermarket for this particular bear, according to District Game Warden Steve Allarie. He believes this same bear has been spotted in Winthrop at least 15 times in recent weeks. Most of those sightings have occurred in the Route 133/High Street area. Remley lives on Vista Drive, which is off High Street. The state has collected more than 400 bear complaints since January, according to Department of Inland Fisheries and Wildlife officials. That is more than double the 201 complaints during the same time period last year and nearly the 230 complaints the year before. Marden said the jump in sightings is because of a growing bear population and the time of year. A bear’s natural food — berries and grubs — are in short supply in the late spring and early summer. With natural food hard to come by, a bear will sometimes turn up in residential areas, particularly homeowners with an affinity for birds. 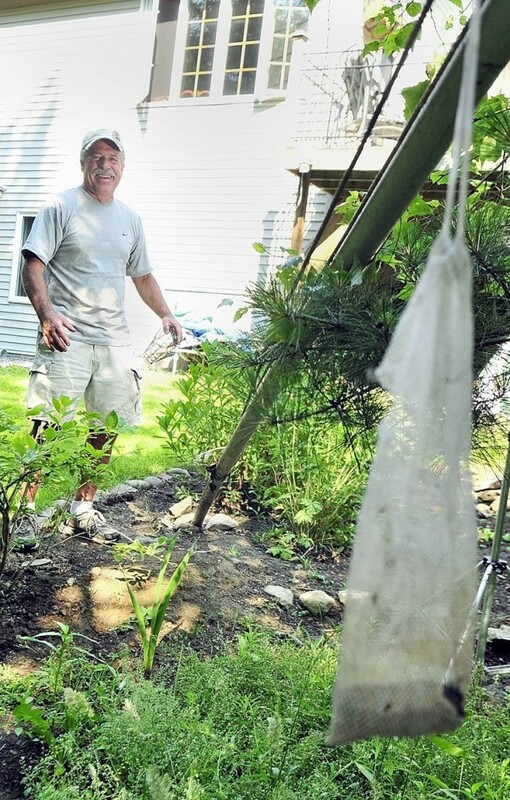 “I would say 99 percent of the calls we get are bird feeder-related,” Allarie said. State officials hope those who have bird feeders in the area will remove them for now. If you want to continue feeding the birds, it’s best to put the feeders out for a few hours in the afternoon and them put them away, he said. Marden said it is important to pick up food knocked to the ground and, if you do spot a bear, feeders should be put away all together for a few weeks to give the bear a chance to move along. “If you and I were hungry and had a free buffet sitting in front of us, we’d take advantage of it,” Marden said. Allarie said residents should also make sure to clean their gas grills, preferably using ammonia, and trash should be stored inside until just before its loaded for the dump. Allarie said the bear spotted recently in central Maine has shown no signs of being aggressive to people. The bear may have a tag, which means it has been marked by a biologist or was labeled as a nuisance bear in Maine, or even another state. If the bear continues to show up it may become a candidate for relocation, he said. If you see the bear, Marden suggested just using common sense: you can yell out of a house window or flick on the lights at night. Ultimately, as Remley learned, the bear will leave when it’s done snacking. “You just don’t want to try to pet it or try to feed it,” Marden said. Allarie said the best response may be to enjoy what is typically an unusual interaction. In hindsight, Remley said that’s how he feels. He’ll fix the flag pole and it will continue to remind him of his chance encounter. “It was kind of freaky in one way, but kind of cool in another,” he said.